Create your dream oasis right outside your back door with our large selection of outdoor fire features. Your enhanced backyard will be the envy of the neighborhood! From energy-efficient tankless water heaters to stylish stainless-steel appliances and warming gas logs, propane products deliver what homeowners want. Whether you're outfitting a kitchen, a master suite bathroom, or a downstairs laundry room, you can put propane to work anywhere in a home. But propane is more than just versatile; it's also one of the most environmentally friendly, energy-efficient, high-performing energy sources you can choose! Since its beginning over 50 years ago, Palmetto Propane, Fuels and Ice has grown to provide South Carolina's residents and businesses with a comprehensive line of fuels, lubricants, propane gas services and appliances, gas equipment, outdoor cooking products, service station programs and much more. Today Palmetto Propane is your full-service petroleum products company. 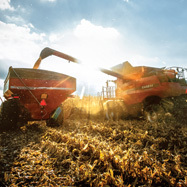 And whether it's your family car, heavy equipment on a temporary job site, a fleet of cars and trucks, or industrial and farming requirements, we are committed to keeping you moving. Palmetto Propane, Fuels, & Ice is a proud member of the Alliance AutoGas Network. Alliance AutoGas is the only complete program to help American fleets transition from gasoline to autogas, the world’s most popular alternative fuel. 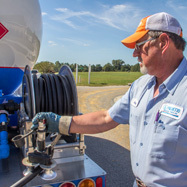 Working with Alliance AutoGas to launch a successful autogas program is the easiest, most affordable way to reduce your gasoline consumption, cut fuel costs and lower vehicle emissions. With propane you get more hot water from your tankless water heater because it recovers 2½ times faster than an electric one, and it costs about 30 percent less to operate. You can reheat a whole tankful of water in just 20 minutes with propane, compared to an hour with electricity. 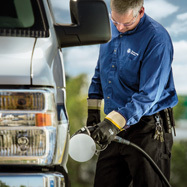 Overall, propane fuel for fleet vehicles typically costs less than conventional or reformulated gasoline. Many states offer fuel tax incentives to encourage the use of clean fuels, thus further reducing operating costs. By relying on propane for various applications in your home, including heating and power for your appliances, you’re lessening your dependence on the electric grid in the event of an electric power outage. With propane you can still have heat, hot water and hot food during outages even in the worst of weather conditions. On average, a propane heating system is 20 degrees warmer compared to electric heat pumps that dispense cooler air. Propane gas furnaces last an average of 20 years, while electric heat pumps last an average of 14 years. It also costs less to repair a propane gas furnace than an electric heat pump. Propane is an affordable fuel, costing up to half as much as electricity and providing more output. 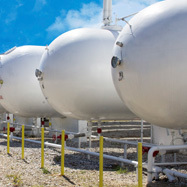 Propane is a reliable, efficient, and widely available fuel that does not require connection to the electrical grid. Heat, hot water, and cooking appliances are always available, regardless of the weather. Over 90 percent of the propane used in America is made in the U.S., reducing our dependence on foreign oil. Propane gas is nontoxic and insoluble in water, so it's not harmful to soil and water. Because propane does not endanger the environment, the placement of propane tanks either above or below ground is not regulated by the Environmental Protection Agency. According to the EPA, much of the sulfur dioxide in the atmosphere, which produces acid rain, is attributable to coal-fired electricity-generating facilities. In contrast, neither the process by which propane is produced nor the combustion of propane gas produces significant acid rain contaminants. Propane autogas is an approved clean alternative fuel under the Clean Air Act of 1990 and the third most popular vehicle fuel worldwide behind gasoline and diesel. Propane is commonly used to fuel buses, light- and medium-duty trucks, vans, shuttles, taxicabs, and police and government vehicles.